MONDAY morning was Pope Francis’ last Mass in the chapel of the anta Marta Residence before his summer break. Masses will resume in September after the Pope’s trip to Colombia scheduled for September 6 to 11. TUESDAY at 8 am in the Pauline Chapel. Pope Francis will concelebrate Mass with the cardinals present in Rome on the occasion of the 25th anniversary of his Episcopal ordination. At 9:30 he will meet with a delegation from the Ecumenical Patriarchate of Constantinople as it visits Rome for the June 29th feast of St. Peter and Paul, Apostles. At 10 am he is scheduled to meet with Cardinal George Pell, prefect of the Secretariat for the Economy. WEDNESDAY at 9 am in the Paul VI Hall, the Holy Father will meet with a delegation of about 1,000 members of the Confederation of Italian Labor Unions. At 10 in St. Peter’s Square he will preside at the final general audience before the summer break. Audiences will resume August 2. At 4 pm Wednesday in St. Peter’s Basilica, the Pope will preside at an ordinary public consistory for the creation of five new cardinals. From 6 to 8 pm that day, courtesy visits to the new cardinals will take place in the Paul VI Hall. THURSDAY, June 29, feast of St. Peter and Paul, Apostles, patron saints of Rome, is a holiday in both the Vatican and Rome. At 9:30 am in St. Peter’s Square, Mass with the rite of the blessings of palliums for the new metropolitan archbishops. The 5 new cardinals will be present, as will members of the College of Cardinals, bishops and priests. Pope Francis will recite the Angelus at noon. The Holy See is observing with grave concern the personal situation of Bishop Peter Shao Zhumin of Wenzhou, forcibly removed from his episcopal see some time ago. The diocesan Catholic community and his relatives have no news or reasons for his removal, nor do they know where he is being held. In this respect, the Holy See, profoundly saddened for this and other similar episodes that unfortunately do not facilitate ways of understanding, expresses the hope that Bishop Peter Shao Zhumin may return as soon as possible to the diocese and that he can be assured the possibility of serenely exercising his episcopal ministry. We are all invited to pray for Bishop Shao Zhumin and for the path of the Catholic Church in China. The bishop disappeared after being called for a meeting with the Office for Religious Affairs. Bishop Shao is recognized by the Vatican, but not by the government. The bishop’s mother, 90, asks to be able to see her son. Catholics in Wenzhou ask for prayers for their shepherd, so he may be “strong” in faith and witness. In the past some underground bishops were killed while in police hands. Wenzhou (AsiaNews) – There is still no news of Msgr. Peter Shao Zhumin, bishop of Wenzhou (Zhejiang). The diocese’s faithful are very concerned, and with them also the bishop’s mother, a 90-year-old woman who has already asked several times to see her son. Msgr. Shao, 54, disappeared last May 18, after being invited at 9 am to the office for religious affairs in the city. His whereabouts remain unknown. On May 22, he made a request to his co-workers to have wine for the celebration of Mass, but since then nothing has been heard. Priests and faithful say they do not know where he is and the authorities will tell them nothing. A message sent to AsiaNews by a member of the faithful asks for “prayers to God to guide him to have a strong faith and a clear witness.” Msgr. Shao had been kidnapped already in April, a few days ahead of Easter, perhaps to prevent him from commemorating the rites of Holy Week with the faithful and his priests. Bishop Shao is a member of the underground community and as a bishop is not recognized by the government. The Holy See, however, confirmed him as ordinary bishop of the diocese, after the death of his predecessor, Msgr. Vincenzo Zhu Weifang, on September 7th. It is most likely that his forced disappearance aims to persuade the prelate to enroll in the Patriotic Association (PA), the party body that wants to build an independent Church, which is “inconsistent with Catholic doctrine “as Benedict XVI affirms in his 2007 Letter to Chinese Catholics, a position confirmed by Pope Francis. Bishop Peter Shao Zhumin of Wenzhou, a bishop not recognised by the overnment, is missing again. The bishop apparently arrived at Wenzhou airport, but did not go home. Government officials took him to an unknown place. His priests did not see him at home. According to the latest figures, Wenzhou Catholics number 130,000. Wenzhou (AsiaNews) – Msgr. Peter Shao Zhumin, ordinary bishop of Wenzhou, is still in the hands of the police held at an unknown location. A report AsiaNews received two days ago was only partially right. Three days ago, the bishop was seen at Wenzhou Airport waiting for luggage. A Catholic who was there by chance took a photo of him. This led some Catholics to believe that the bishop had finally been brought back to his city. However, a day later, some priests in the diocese noted that the bishop had not been seen at his home. When he was getting his luggage at the airport, the prelate was accompanied by government officers, perhaps plain-clothes police, who drove him in a Volkswagen, not home, but to an unknown location. Bishop Shao, 54, belongs to Wenzhou’s unofficial Catholic community, which is not recognised by the government. He is the ordinary bishop of the local diocese. He was taken on 18 May by police and was held for almost a month until he was seen at the airport. It is thought that his absence, like previous disappearances, was part of an attempt to persuade him to join the Chinese Patriotic Catholic Association so that he can be under its control. For the latter, “underground” bishops are regarded as “unreliable”. The silence on the persecution of Chinese Catholics and their bishops in Wenzhou and Shanghai. The organisms that Benedict XVI did not accept (Patriotic Association and Chinese Bishops’ Conference) because “incompatible with Catholic doctrine” now govern the Church. Dialogue between China and the Vatican must address the issue of underground bishops out in the open and not under the shroud of secrecy. An analysis from a northeast Chinese Catholic, as the Vatican celebrates a new round of China-Holy See talks. One of the new cardinals created today by Pope Francis is Fr. Ernest Simoni, 86. You will hear more about him in coming days as his will be the most unique, the most touching, the most heroic of all the stories of the 17 new red hats. Here is a brief look at the future eminence – a story by staff writers of La Stampa newspaper who covered Pope Francis’ visit to Albania in September 2014. Pope Francis welcomed Fr. Ernest Simoni – the Albanian priest who spent 28 years behind bars – by kissing his hands. A moved Pope had embraced him on September 21, 2014 in Tirana, after listening to the account of his persecution. “Fr. Ernest was subjected to 11,000 days of torture and forced labor,” says Mimmo Muolo, a journalist who writes for the Italian Catholic newspaper Avvenire. Muolo also authored a book on Fr. Ernest Simoni. From persecution to his meeting with the Pope. The priest handed a copy of the book to the Pope in person. He was accompanied by Sister Marisa, a representative of Edizioni Paoline which published the volume. “My persecution,” Fr. Simoni said, “began on Christmas Eve in 1963 when I was arrested and put in solitary confinement, tortured and sentenced to death, simply because I was a priest.” His cellmate was told to record “the foreseeable rage” of the priest against the regime: but Fr. Ernest had nothing but prayers and words of forgiveness for his persecutors. And so his sentence was reduced to 25 years of forced labor in the mines and sewers of Scutari. “When I was in prison,” the priest recalled, “I celebrated mass in Latin by memory and I gave communion”. A CNS story at the end of the 2014 Albania trip noted that, “two survivors of Albania’s communist crackdown against the Church brought Pope Francis to tears with their stories during a vespers service in Tirana’s cathedral September 21. “To hear a martyr talk about his own martyrdom is intense,” the pope told journalists on the papal plane back to Rome the same evening. “I think all of us there were moved, all of us.” Franciscan Father Ernest Simoni, then 84, talked about his life as a priest under a militant atheist regime that targeted people of every faith — Christian and Muslim — between 1944 and 1991. Despite the risks of torture, imprisonment and execution, people held onto their beliefs as best they could, praying and passing on their traditions underground. I saw a wonderful article about Mother Teresa on AsiaNews – an interview with Archbishop Henry Sebastian D’Souza of Calcutta – and wanted to share that with you, and you’ll find that below the announcement of the forthcoming canonizations. I need not say another word here about Mother Teresa but I do want to point out that Blessed Stanisłaus of Jesus and Mary, founder of the Marians of the Immaculate Conception, is special to me because he founded the Order of a priest we all follow on EWTN, Fr. Joe Roesch, who offers us wonderful presentations on Divine Mercy. I am quite familiar with the house where the Marians live in Rome and have been blessed to join them for meals on a number of occasions. I do not know as much as I should about Blessed Maria Elizabeth Hesselblad of Sweden, although I do know the motherhouse of the branch of the Bridgettines that she founded – it is in Rome on Via Montserrato, adjacent to Piazza Farnese. This is the largest branch of the Bridgettines and was founded by Elisabeth, a nurse, on September 8, 1911. 1n fact, St. Brigida (Birgitta in Swedish) once lived in the building we see today. Mother Tekla Famiglietti, the Italian-born abbess general of the Order since 1979, had many doors open to her in the Vatican when John Paul was Pope and she was, in fact, with him the night he died. The first time I met her – almost 10 years ago to the day – wss one of the more surprising moments of my life. Pope Benedict held a consistory on March 24, 2006 to create new cardinals. The afternoon of such a consistory, the new Eminences receive friends and family in what are called “courtesy visits” in various rooms of the Apostolic Palace and/or the Paul VI Hall. I had followed the vicissitudes of the Church in China for years and was very anxious to meet and greet the new Chinese eminence, Cardinal Joseph Zen of Hong Kong. I stood in the fairly long line to greet him and was almost first in line when a nun, accompanied by a very tall man stepped right up to greet Cardinal Zen. I had learned that other cardinals, and VIPS like a mayor or senator – or certain nuns! – had the right to step to the front of the line and that is what happened. As the tall genteleman turned around to apologize to me and my friend Libby. I recognized that it was the then Swedish Ambassador to the Holy See. He smiled and greeted me, and the nun, Mother Tekla, as it turned out, turned around as well and when she saw me her face was wreathed in smiles: “Why I always watch you on television,” were her first words to me! She thanked me for my work and I obviously replied in kind and we spoke briefly. Now I have to pay another visit to the motherhouse! Blessed José Luis Sánchez del Río of Mexico has fascinated me since I saw the epic 2012 movie, “For Greater Glory” (aka Cristiada). This was a powerful chronicle of the 1926-29 Cristeros War by the people of Mexico against the atheistic Mexican government. Dozens of martyrs from the Cristeros time have been beatified by the Church, including 14-year-old Jose Sanchez del Rio who was declared blessed by Pope Benedict XVI in 2005. His story is absolutely riveting and is a highlight of this film. On July 6, 2012, Andy Garcia was awarded the Silver Fish for his role in “For Greater Glory” at the Catholic Film festival in Rome and I accepted the award for him in his absence. Try to rent or buy this film, – you will never forget the story. Be sure to see it before the October 16 canonization date! (Vatican Radio) At a consistory held on Tuesday, Pope Francis gave his approval for the canonization of five new saints. The Public Ordinary Consistory for the Canonization of Blesseds began with the celebration of Terce (Midmorning Prayer), presided over by the Holy Father in the Consistory Hall at the Apostolic Palace. Following the liturgical prayer, the Holy Father announced the upcoming canonization of five new saints, including Blessed Mother Teresa of Kolkata (Calcutta), born Anjezë Gonxhe Bojaxhiu, whose work among the “poorest of the poor” won her worldwide acclaim. Hundreds of Missionaries of Charity, members of the religious order founded by Mother Teresa, are expected to be in Rome for her canonization, set for September 4, 2016. The future saint from Poland: Blessed Stanisłaus of Jesus and Mary (né Jan Papczynski) was a member of the Piarist Order. After leaving the Piarists, he founded the Marians of the Immaculate Conception. The two northern Europeans will be canonized together on Sunday, June 5. He will be canonized on October 16, along with Blessed José Luis Sánchez del Río of Mexico. Blessed José was just fourteen-years-old when he was martyred by the Mexican government during the Cristeros War, after refusing to deny his Faith. The archbishop of the metropolis during the soon-to-be-proclaimed Saint’s mission, Msgr. Henry Sebastian D’Souza, tells AsiaNews about the last days of Mother Teresa and her legacy for India and for the world: “The beauty of life and of Mother Teresa’s mission is that she was able to transcend the barriers of race, language, culture, social status … Whatever barrier. She was the image of Jesus, His face in the world”. Calcutta (AsiaNews) – Mother Teresa “was the face of Christ in the world, a person who spent her life to help us understand the nature of the divine. That’s why she does not belong to only Calcutta or India, but to the whole world and ultimately to Jesus” says Mgr. Henry Sebastian D’Souza, archbishop emeritus who led Calcutta from 1986 to 2002, during the years of the soon-to-be-proclaimed Saint’s mission. Pope Francis has decided that her canonization will take place in Rome on September 4, 2016. Your Grace, you were the Archbishop when Mother died. Share with us Mother’s last days. How did she pass from this life to the next? I was not present when Mother Teresa died. I was in Rome by invitation of Cardinal Ratzinger to present the Catechism of the Catholic Church to the Holy Father. I had been the Asian representative for the composition of this Catechism. On hearing of Mother Teresa’s death I returned immediately. I was told that Fr. Hansel D’Souza the Parish Priest of St. Mary’s Church anointed Mother Teresa before she died. Can you share with the readers, the few days following her death, of the requests you received for Mother’s process to be initiated. After Mother Teresa died I had the responsibility of handling her funeral. I had been blessed with the assistance of Mr. Bill Canny of Catholic Relief Services (CRS). He had come to see me some months before Mother Teresa died. He asked me if I had any plans in place in case of her death. I had none. He advised me to make the plan. Accordingly we sat together, discussed the various issues and visited several places where the body could lie in state until the actual funeral. We anticipated large number of dignitaries who would need to be met, accommodated as well as seated for the funeral. There were also details about how to preserve the body during the days after the death, on how to handle the crowds who would want to obtain a last blessing from her, on how to organize the liturgy with its music, etc. Mr. Bill Canny proved to be an excellent strategist. After several discussions he drew up a plan of several pages to cover all the details after her death. It was a very comprehensive document and excellently planned. I gave a copy to the Sister in Charge in Mother House and another to Fr. Valerian Nazareth the Parish Priest of St. Thomas’ Church where the body would lie in state; a third copy was with me. Mr. Bill Canny would be the CRS coordinator for all the anticipated events. As a result of this planning, my absence from Calcutta when Mother died was not felt. The Vicar General, Mgr. Francis Gomes, took the copy of the plan and started all the arrangements along with Mr. Bill Canny and Fr. Valerian Nazareth. The meticulous planning had paid off. The required medical care for the preservation of Mother’s body was attended to by the MC Sisters. Fr. Valerian organized arrangements in St. Thomas’ Church so as to allow the queues of people coming from far and wide to move in an orderly fashion, while they paid their respects. The hundreds of dignitaries were also suitably met and accommodated. I can only be grateful for the support I received at this crucial moment when Mother Teresa died. Can you tell us about the opening of diocesan enquiry? After the death and funeral of Mother Teresa I received innumerable letters requesting me to start the process of her canonization. Within a few months I wrote to the Congregation for the Canonization of Saints to give me the permission to begin the process. By Canon Law the process can only begin after five years. I needed an exemption. I cited the fact that many key witnesses were very old and may not survive the mandatory five years. The reply from the Prefect of the Congregation was that the rule had to be maintained. However he advised me to start collecting in an informal way such evidence that might become helpful. I must say I did not do anything in that line. However within a year I got another letter from the Prefect of the Congregation, stating that it had obtained the required permission for the process. I was requested to initiate the canonization process immediately. I was lucky to have a qualified canonist in Bishop Salvador Lobo. He was my suffragan and neighbour in Calcutta. He resided within an hour’s drive from Archbishop’s House in Calcutta. Bishop Salvador Lobo agreed to head the Commission and to do the needful for gathering evidence for the Process. He identified suitable persons as the secretary and notary. Thus the Process began in a room in Archbishop’s House. I am deeply grateful to Bishop Lobo. He was able to complete the work within a year and we were able to transship three dozen boxes of evidence to Rome. Fr. Brian Koloudowinsky was the person who took the documents and delivered them safely to the Congregation. “The Sunshine of the Darkness is Bright”, can you explain this in Mother’s Life, mission and now her Sainthood? I have said enough about Mother Teresa’s life and mission. The aspect of her dark night was not known to me. She always met me with her radiant smile. After reading her life and struggle I realized how the darkness was bright. He is your safeguard, through sunshine and shade. The three quotations explain her life and mission and give us the key to her sanctity in spite of the darkness in her soul. Why did the Communist Government give a Catholic nun a State funeral? The funeral of Mother Teresa was taken over by the Army. It was not just a State Funeral. It became a national event. The National Flag draped her coffin from St. Thomas’ Church to the Stadium where the funeral took place and then to the Mother House where she was laid to rest. The National Anthem was played with bugles as the body was lowered into the tomb. Mother Teresa had passed into history. She did not belong to her native country. She did not belong to Calcutta. She belonged to India and the World. But in fact she belonged to Jesus. Was religious freedom an important tool in Mother’s mission in India? Pope Francis was really busy this week as we know, but I guess he has not had time to tweet! His last tweet, in fact, was February 8, and he usually posts 4 or 5 times a week at least. Looking forward to your next gem, Holy Father! (Vatican Radio) Pope Francis on Monday denounced the murder of 21 Coptic Christians by ISIL militants in Libya. The Islamist terrorist organization released a video of the killings on Sunday. “The martyrs are from all the Christians,” he said. Monday afternoon, Pope Francis telephoned the Patriarch of the Coptic Orthodox Church, Pope Tawadros II, to express sincere condolences to the Coptic Church for the recent barbaric assassination of Coptic Christians by militants of the fundamentalist Islamic State. The Holy Father promised his prayers today and also tomorrow, the day of the funeral celebrations for the victims, and unites himself spiritually to the prayers and the sorrow of the Coptic Church in his morning Mass. As you all know, Saturday, February 14 and the feast of St. Valentine, was a wonderful day for the Universal Church when Pope Francis created 20 new members of the College of Cardinals, men hailing from some very faraway lands, including a remote series of islands in the Pacific Ocean. The new Princes of the Church, in fact, come from Tonga, Thailand, Myanmar, Vietnam, Ethiopia, New Zealand and Cape Verde, joining cardinals from countries that traditionally have one or more red hats – Mexico, Portugal, Italy, Uruguay, Spain, Panama and Colombia. Tonga, Myanmar and Cape Verde are the three countries that, up to yesterday, never had a cardinal. The consistory in which the new cardinals receive the red hat, their cardinalatial ring and a titular church in Rome is obviously the focus of this important day but there is an event later that afternoon that offers another important occasion to the cardinals and to their friends, family members, and members of the Roman Curia. A two-hour slot – 4:30 to 6:30 pm – is set aside the afternoon of the consistory for what the Vatican calls “courtesy visits.” Each new cardinal is assigned a room (or part of a room) in the Apostolic Palace or a place in either the atrium or the main hall of the Paul VI Hall. Signs clearly indicate where guests can find the cardinal they want to meet and greet, and each cardinal is provided with a table, a chair if they wish to sit, some water and a potted plant or two that completes the atmosphere. Most cardinals have at their side their priest secretary who, in many cases, receives a visitor’s card if they have one and offers holy cards to visitors as a kind of souvenir of this red-letter day in the cardinal’s life. I always look forward to these visits for a myriad of reasons, foremost of which is, of course, meeting the new cardinals as well as some of the faithful from their country. It is also an occasion to see friends from out of town who come to Rome for such important events and to see former colleagues and many friends of the Roman Curia with whom I worked for years. There are receiving lines for each cardinal but they become, usually after only a few minutes, “bunches” of pilgrims, instead of lines. Men, women and children, but especially nuns, I have to say, vie to be the next person to meet, greet, hug or be blessed by the new cardinal. Bishops and cardinals also come to greet the new red hats but they automatically go to the head of the line (or bunch, as it may be)! 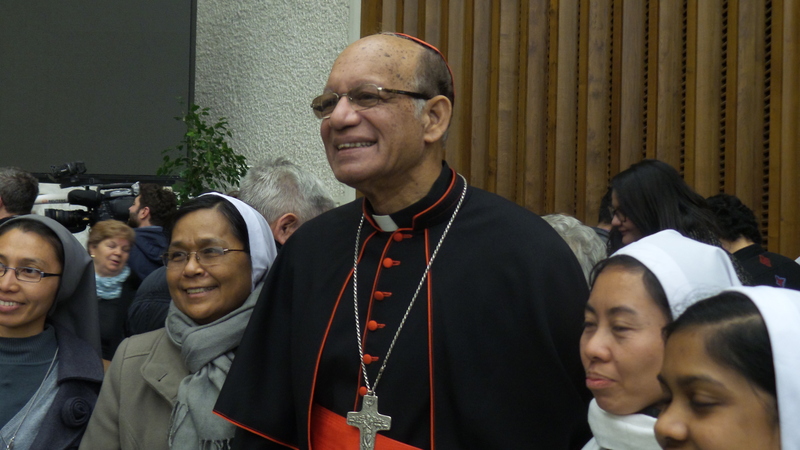 It was enormous fun this year to meet the cardinals from Tonga, Cape Verde, Thailand, Myanmar and Ethiopia – but especially the faithful who came to Rome with them on pilgrimage as they really increased the level of joy in the Paul VI Hall with their smiles, infectious laughter and singing. Friday morning as I was leaving my apartment to go to the Vatican, a sizeable group of Tonga faithful was walking by my house from their nearby hotel. They personified joy. I stopped them, we spoke briefly and I assured them I’d see them again Saturday during the courtesy visits. 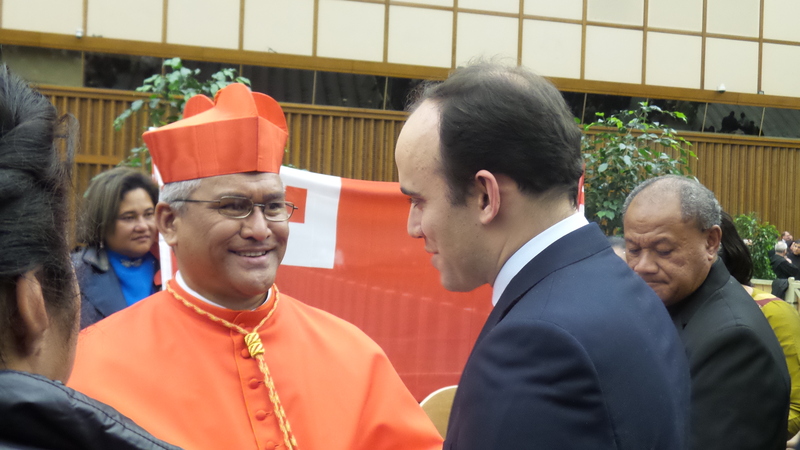 Cardinal Mafi of Tonga was the first cardinal I met at the courtesy visits. 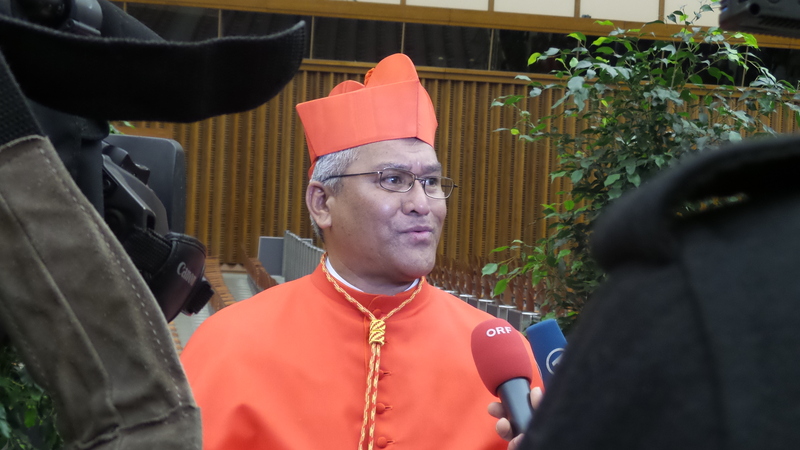 He is not only the youngest member of the College of Cardinals, he is Tonga’s first ever cardinal. My priority Saturday was to greet those cardinals from countries that had never had one before, the cardinals from lands where relations with the Church are perhaps troubled or the country itself has big political issues and also the cardinals from lands so distant they might not be visiting Rome as frequently as other members of the College of Cardinals. All the new men, however, will be assigned as members of some Vatican congregation or pontifical council and will thus be in Rome at least a few times a year. All new cardinals will also have to take official possession of their titular church: some might remain in Rome these days to do so while most will return to the Eternal City at a future date. Speaking English, he went on in that vein, thanking me and the entire EWTN family for what we do for the Church. I then met Cardinal Charles Mauna Bo, SDB, of Yangoon, Myanmar (Burma), and he said almost the same thing. He thanked me and asked me to thank my EWTN colleagues for all we do for the Church, and also asked me to stay in touch with him. The Church in Myanmar is small but very vibrant, as I saw in the faithful who had come with Cardinal Bo – their enthusiasm mirrored the cardinal’s own, even as he faces challenges peculiar to the Church in Myanmar and some he has in common with the Universal Church. As I left Cardinal Bo to go meet Cardinal Francis Xavier Kriengsak Kovithavanij of Bangkok, Thailand, I ran into an acquaintance, Cardinal Oswald Gracias of Bombay (Mumbai), who is a member of Pope Francis’ C9 or Council of Cardinals that advise the Holy Father. 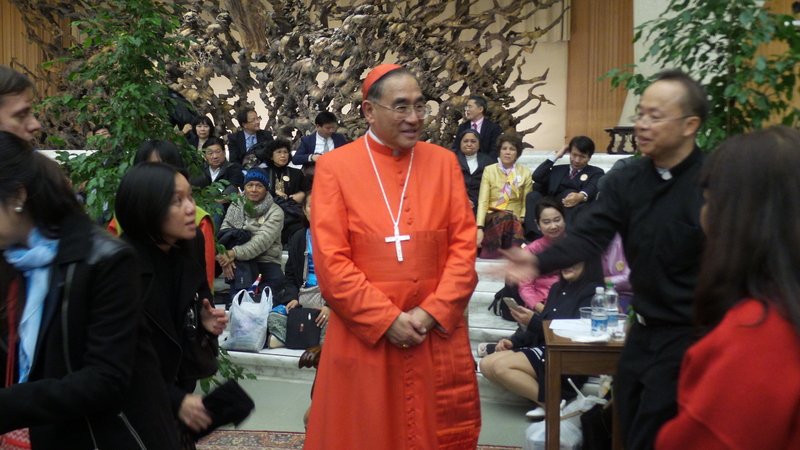 We chatted only briefly before he too paid his respects on the new cardinals of Yangon and Bangkok. Cardinal Gracias emphasized what a wonderful day it had been for the Universal Church with the “new” faces from both the new and old worlds. 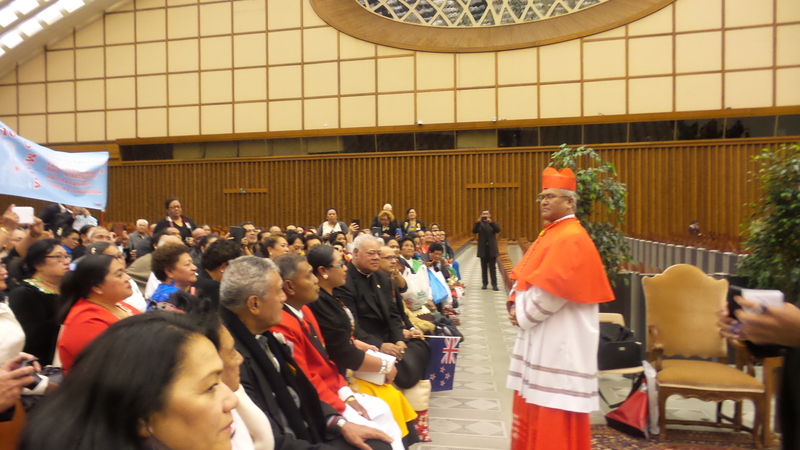 Working my way through a big crowd of his fans and friends, I next met Cardinal Kovithavanij of Bangkok. He said he was greatly honored by the Holy Father but, more than that, his Church was honored when he was named a cardinal. A nation of almost 65 million people, Catholics are less than one-half of a percent. I then visited, as you will see in the photos below, Cardinals Arlindo Gomes Furtado of Santiago de Cabo Verde, Archipelago of Cape Verde, Pierre Nguyen Van Nhon of Hanoi, Vietnam, Manuel Jose Macario do Nascimento Clemente of Lisbon, Portugal and Berhaneyesus Demerew Souraphiel, Archbishop of Addis Abeba, Ethiopia. I was taken aback when I met Cardinal Souraphiel because, as I was about to introduce myself, he smiled and said, “I know you, Joan’s Rome. I’m always watching you on EWTN.” He thanked me and the network for all we do for the Church and to explain and proclaim the faith. The last cardinal I greeted was Cardinal John Atcherley Dew, archbishop of Wellington, New Zealand, but I totally forgot to take a photo. There are many reasons to follow these prelates and all the new cardinals because, in naming them, Pope Francis truly did change the face of the College of Cardinals, going out to the peripheries, as he has said from Day One of his papacy, and selecting men from cultures that many of us in the West do not know well. For the first time in the history of the Church, there are almost as many cardinals from outside Europe (109) as there are from Europe. And, for the first time, there are more non-European electors that European: as of now, only 57 of the 125 cardinal electors are European. Notably, however, 26 of those 57 are from Italy. In toto, the College of Cardinals includes 5 continents (America is considered as one continent by the Vatican, whereas for many people, North America is a continent and South America is another, separate one), and 73 countries, 59 of which have cardinal electors. Talking to the new Princes of the Church, so many from farflung lands, what surfaced was a vibrant faith, a strong sense of hope, great enthusiasm for the tasks ahead and a desire to learn from Pope Francis and to bring to the Holy Father and the Church insights coming from different cultures, some extraordinarily rich because they are ancient cultures, some rich because they are fairly new. Humility in service was a common denominator. And surprise! Surprise at learning, without advance warning, that Pope Francis had chosen them for the College of Cardinals. 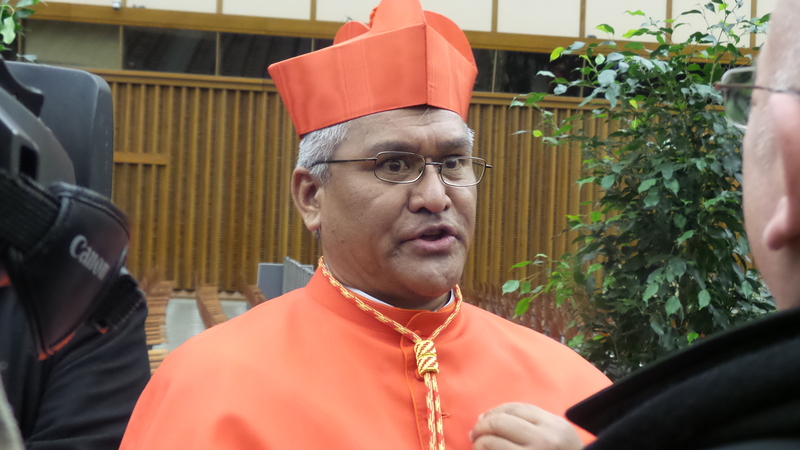 Cardinal Soane Patita Paini Mafi was born on 19 December 1961 in Nuku’alofa on the island of Tongatapu in the diocese of Tonga. He studied philosophy and theology in the Pacific Regional Seminary in Fiji. He was ordained a priest on 29 June 1991. On 28 June 2007 he was appointed as coadjutor bishop of Tonga (Kingdom of Tonga) by Pope Benedict XVI. From 2010 he has served as president of the Episcopal Conference of the Pacific, and in this role he participated in the Third Extraordinary Assembly of the Synod of Bishops on the family in October 2014. Monday at noon, Pope Francis received King Tupou VI (Ahoeitu Unuakiotonga Tukuaho Tupou VI), Queen Nanasipau’aho and an entourage comprising the official Tonga delegation to the consistory. Cardinal Charles Maung Bo, S.D.B., was born in Monhla Village, Shwebo District, Mandalay Division, in the archdiocese of Mandalay on 29 October 1948. He studied at “Nazareth” Salesian Aspirantate, Anisakan, in Pyin Oo Lwin from 1962 till 1976. He made his First Profession on May 24, 1970 and his Final Profession on March 10, 1976. He was ordained to the priesthood of Salesians of Saint John Bosco, in Lashio, N.S.S. on 9 April, 1976. Upon ordination, he was assigned as Parish Priest at Loihkam from 1976 to 1981, and in Lashio from 1981 to 1983. After serving as Parish Priest, from 1983 until 1985 he was posted at Anisakan as Formator. He served as Apostolic Administrator in Lashio from 1985 to 1986 and as Apostolic Prefect from 1986 to 1990. When the prefecture was elevated to the status of diocese (7 July 1990), he was appointed as first bishop of the new diocese. He received Episcopal consecration on 16 December of the same year. He was appointed as bishop of Pathein by Pope John Paul II on 13 March 1996. On May 24, 2003, he was nominated Archbishop of Yangon and was installed on 7 June, 2003. He served as president of the Catholic Bishops’ Conference of Myanmar from 2000 to 2006. Created and proclaimed Cardinal by Pope Francis in the consistory of 14 February 2015, of the Title of Sant’Ireneo a Centocelle. Cardinal Francis Xavier Kriengsak Kovithavanij was born on 27 June 1949 in Ban Rak in the archdiocese of Bangkok. He studied in the seminary of St. Joseph in Sampran. Sent to Rome, he undertook studies in theology and philosophy at the Pontifical Urbanian University (1970-1976), residing at the Collegio Urbano. He was ordained a priest on 11 July 1976 and incardinated in the archdiocese of Bangkok. In the same year he served as parish vicar in the Nativity of Mary Church in Ban Pan; parish vicar in the Epiphany Church in Koh Vai from 1977-1979, and vice-rector of the St. Joseph in Sampran minor seminary from 1979 to 1981. From 1982 to 1983 he undertook specialist studies in spirituality at the Pontifical Gregorian University, Rome. He then returned to Thailand, where he spent six year as rector of the Holy Family intermediate seminary in Nakhon Ratchasima. He was rector of the Lux Mundi national major seminary from 1992 to 2000, and from 1989 to 1993 he served as under-secretary of the Episcopal Conference. He was appointed as extraordinary professor at the major seminary of Sampran in 2001. He served as parish priest of the Our Lady of Lourdes parish in Hua Take from 2000 to 2003, and parish priest of the Cathedral and secretary of the presbyteral council of the archdiocese of Bangkok from 2003 to 2007. He was appointed as bishop of Nakhon Sawan by Pope Benedict XVI on 7 March 2007, receiving Episcopal consecration on 2 June 2007. He was appointed as metropolitan archbishop of Bangkok (Thailand) on 14 May 2009. He has served as vice-president of the Catholic Bishops’ Conference of Thailand since 2009. Created and proclaimed Cardinal by Pope Francis in the consistory of 14 February 2015, of the Title of Santa Maria Addolorata. Cardinal Arlindo Gomes Furtado was born in November 1949 in Santa Catarina, in the diocese of Santiago de Cabo Verde. He studied in his homeland and in Rome, at the Biblicum, where he obtained a licentiate in holy Scriptures. He was ordained a priest on 18 July 1976. After priestly ordination he served as parish vicar (1976-1978), diocesan chancellor and bursar (1978-1984), and chaplain of the people of Cabo Verde in the Netherlands (1985-1986). He studied holy Scriptures in Rome from 1986 to 1990, and upon returning to his homeland, served as professor (1990-1996), vicar general and parish priest (1996-2003). On 9 December 2003, Pope John Paul II appointed him as first bishop of the newly-erected diocese of Mindelo. On 22 July 2009 he was appointed as bishop of Santiago de Cabo Verde by Pope Benedict XVI. Created and proclaimed Cardinal by Pope Francis in the consistory of 14 February 2015, of the Title of San Timoteo. Cardinal Pierre Nguyên Văn Nhon was born on 1 April 1938 in Ðà Lat (Viêt Nam). He studied in Viêt Nam and received priestly ordination on 21 December 1967. He was appointed as coadjutor bishop of Ðà Lat on 11 October 1991 and received Episcopal consecration on 3 December 1991. As coadjutor, he went on to become ordinary bishop of Ðà Lat on 23 March 1994. 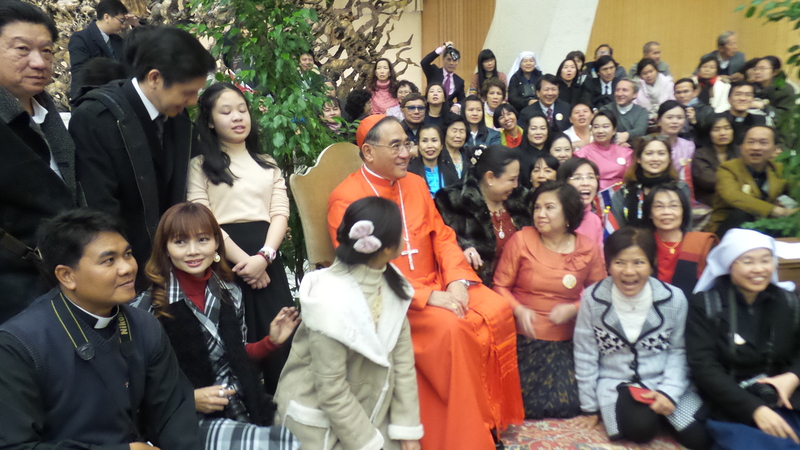 In 2007 he was elected president of the Catholic Bishops’ Conference of Viêt Nam, a post he held until 2013. On 22 April 2010, Pope Benedict XVI appointed him as coadjutor of the Archdiocese of Hà Nôi. A few weeks later, on 13 May, he become archbishop of the same archdiocese following the resignation of Archbishop Joseph Ngô Quang Kiêt. Created and proclaimed Cardinal by Pope Francis in the consistory of 14 February 2015, of the Title of San Tommaso Apostolo. His Eminence Manuel Jose Macário do Nascimento Clemente was born in Torres Vedras, Patriarchate of Lisbon (Portugal) on 16 July 1948. After obtaining a degree in general history from the University of Lisbon, he entered the Cristo Rei dos Olivais Patriarchal Seminary, where he received a doctorate in theology, specialising in historical theology at the Portuguese Catholic University. On 29 June 1979 he was ordained a priest in the Patriarchate of Lisbon. He served in the following roles in the Patriarchate: vice-rector and rector of the major seminary; lecturer in the Faculty of Theology of the Portuguese Catholic University; and member of the Cathedral Chapter, the presbyteral council and the pastoral council. On 6 November 1999 he was appointed by the Holy Father John Paul II as titular bishop of Pinhel and auxiliary of Lisbon, and received Episcopal ordination on 22 January 2000. On 22 February 2007 the Holy Father Benedict XVI appointed him as bishop of the diocese of Porto. On 18 May 2013 Pope Francis appointed him as Patriarch of Lisbon. On 19 June 2013 he was appointed as President of the Portuguese Episcopal Conference, after having served as vice-president. Within the same Episcopal Conference he has served in the roles of President of the Episcopal Commission for Culture, Cultural Heritage and Social Communications. He is the author of numerous publications and since 2012, member of the Pontifical Council for Social Communications. Created and proclaimed Cardinal by Pope Francis in the consistory of 14 February 2015, of the Title of San Romano Martire. Cardinal Berhaneyesus Demerew Souraphiel was born on 14 July 1948 in Tcheleleka, in the apostolic vicariate of Harar in central Ethiopia. In 1963 he entered the Guder minor seminary, entrusted to the Lazarists. He studied philosophy at the Makanissa major seminary. He was ordained a priest in Addis Abeba on 4 July 1976. In 1980 he was elected as delegate to the general assembly of Lazarists in Rome. During this period he obtained a degree in sociology from the Pontifical Gregorian University. He returned to Addis Abeba in 1983. In 1990 he became Superior of the Lazarist house in Addis Abeba. In 1992 he was appointed as Episcopal vicar for Kaffa and Illubabor. With the erection of the apostolic prefecture of Jimma-Bonga on 10 June 1994 he became its first apostolic prefect. On 7 November 1997 he was appointed as titular bishop of Bita and auxiliary of Addis Abeba,. He received Episcopal ordination on 25 January 1998. On 16 June, as the metropolitan archiepiscopal see of Addis Abeba became vacant following the resignation of Cardinal Paulos Tzadua, he was appointed as administrator “sede vacante” of the same archieparchy. On 7 June 1999 the Holy Father John Paul II appointed him as metropolitan archbishop of Addis Abeba (Ethopia). He is President of the Bishops’ Conference of Ethiopia and Eritrea (since 1999); President of the Council of the Ethiopian Church (since 1998) and, since July 2014, President of the A.E.C.E.A. (Association of Member Episcopal Conferences in Eastern Africa). In his role as President of the Bishops’ Conference of Ethiopia and Eritrea, he participated in the recent Third Extraordinary Assembly of the Synod of Bishops on the family (October 2014). He said, in part: “In the letter your Holiness sent us the day you announced your decision to call us to the College of Cardinals, you reminded us first and foremost that we have been called to a new service which is that of ‘assisting, sustaining and being close to the person of the Pope, and for the good of the Church’. We are grateful for having chosen us from all over the world to share your ministry is a special way, recalling that every ecclesial vocation is, above all, one of service to our brothers and sisters and to the Church. And then, that ever special moment! Tune in to Vatican Insider this weekend for a special on the College of Cardinals – its history and composition, rules and rites – in view of the creation on Saturday, February 14, of 20 new members of the College, 15 of whom are under 80, therefore eligible to vote in a conclave. As usual, Vatican Insider will start with a news segment, than a Q&A on the Seven Gifts of the Holy Spirit, followed by the special. Yesterday, Thursday, the meeting continued in a serene and constructive atmosphere, with interventions by a further 28 cardinals who offered different perspectives on the reform of the Curia, focusing on the relationship between the Curia and the local Churches, and underlining the importance of better serving the Church in the world. They spoke of “decentralization,” and the theme of “subsidiarity” was recurrent. Further reflection was invited on what can be done better and where: or rather, in which cases it would be more useful for the Roman dicasteries to act, and when instead the involvement of the dioceses or the episcopal conferences would be more useful. Other interventions were dedicated to the usefulness and importance of the central service of the Holy See, bearing in mind the experience in various countries where the local church is weak and may be subject to pressure, and is therefore supported by the work of the Vatican. Coordination within the Curia was addressed not with a merely functional focus, but rather from the perspective of a sense of communion between the different dicasteries, of communication that creates union in the common mission. More specifically, the inter-ministerial commissions were referred to as tools for achieving this objective and the importance of continuity in this dimension of coordination was noted. Emphasis was placed on the jurisdiction of the Secretariat of State with regard to the Holy See’s relations with international organizations and entities as a guarantee of coherence and the assumption of a common position. However, this does not mean that the Secretariat of State acts alone, but rather that it involves the dicasteries with specific competences, always with a guiding unity. Simplification is a shared criterion. There were several considerations regarding the qualifications of people working in the Curia, from the point of view of professional competency and ecclesial spirit and dedication. Emphasis was placed on the need for professionals from different parts of the world and for the Church to better reflect her universality. In this respect, there was discussion on the role of the laity, women in particular, in the assumption of positions of responsibility in the Roman Curia. Other interventions focused on the positive elements of the Apostolic Constitution “Pastor bonus,” which must not be lost from view; therefore, the reform process must ensure distinct continuity with this document, especially from an ecclesiological point of view. This morning’s meeting, attended by 164 cardinals, focused primarily on a long report with four interventions on themes of an economic nature, introduced by Cardinal George Pell, president of the Secretariat for the Economy. Joseph F.X. Zahra of the Commission for Reference on the Organisation of the Economic and Administrative Structure of the Holy See (COSEA) then spoke about the study the Commission carried out last year on the organizational issues faced by the Holy See, and he gave information on the Commission’s activity. It was the first time that the College of Cardinals has received such a detailed report in the presence of so many cardinals. The composition, role, work and competences of the Council for the Economy were then the subject of an intervention by Cardinal Reinhard Marx. Cardinal Pell then gave further information regarding the recent activities of the Secretariat, focusing primarily on the balance for the year that has just commenced. Finally, Jean-Baptiste de Franssu, president of the Institute for the Works of Religion (IOR) spoke about the current situation of this body. Following the interventions by the cardinals, several questions were raised to the speakers. As well as asking for more specific details, the cardinals expressed their appreciation for the reorganization work that has taken place and their conviction that this constitutes a convincing reform that prioritizes transparency, integrity and competence. The speed with which it has been put into affect was also praised, given that there are already entities working according to the new guidelines. The reforms, it was affirmed, strengthen the credibility of the Church. Questions of a more technical nature were also posed, regarding the competences of various bodies and the relations between the Holy See and Vatican City State. Although he was present for almost the entire morning session of the consistory of the College of Cardinals, Pope Francis at one point went to a small room off the Paul VI Hall to receive Mrs. Signora Shahindokht Molaverdi, vie-president of the Islamic Republic of Iran. The 20 cardinals that Francis will create on Saturday, including 15 electors, were present at the consistory. The Holy Father opened the morning session of the first day of the consistory. Cardinals will meet again this afternoon and are schedule to meet all day Friday. “’How good, how delightful it is to live as brothers all together!’ (Ps 133,1). In the words of the Psalm we give praise to the Lord who has called us together and gives us the grace to welcome the 20 new cardinals in this session. To them and to all, I give my cordial greetings. Welcome to this communion, which is expressed in collegiality. “Thanks to all those who have prepared this event, especially to His Eminence Cardinal Angelo Sodano, dean of the College of Cardinals. 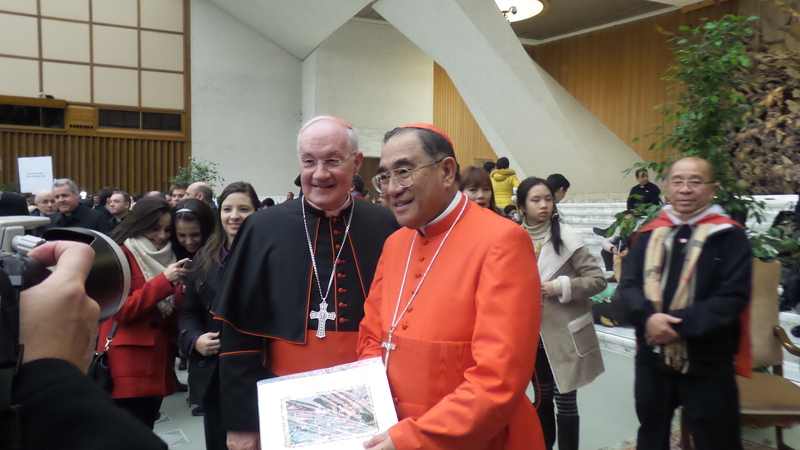 I thank the Commission of nine Cardinals and the coordinator, His Eminence Óscar Andrés Rodríguez Maradiaga. I also thank His Excellency Marcello Semeraro, Secretary of the Commission of Nine Cardinals: Today he will present a summary of the work done in recent months to develop the new Apostolic Constitution for the reform of the Curia. As we know, this summary has been prepared on the basis of many suggestions, even those made by the heads of the Dicasteries, as well as experts in the field. “The goal to be reached is always that of promoting greater harmony in the work of the various Dicasteries and Offices, in order to achieve a more effective collaboration in that absolute transparency which builds authentic sinodality and collegiality. “The reform is not an end in itself, but a means to give a strong Christian witness; to promote a more effective evangelization; to promote a more fruitful ecumenical spirit; to encourage a more constructive dialogue with all. “The reform, strongly advocated by the majority of the Cardinals in the context of the general congregations before the conclave, will further perfect the identity of the same Roman Curia, which is to assist the Successor of Peter in the exercise of his supreme pastoral office for the good of and in the service of the universal Church and the particular Churches. This exercise serves to strengthen the unity of faith and communion of the people of God and promote the mission of the Church in the world. “Certainly, it is not easy to achieve such a goal: it requires time, determination and above all everyone’s cooperation. But to achieve this we must first entrust ourselves to the Holy Spirit, the true guide of the Church, imploring the gift of authentic discernment in prayer. (VIS) – A total of 165 cardinals participated in this morning’s first session of the Extraordinary Consistory with the Holy Father. Twenty-five were unable to attend due to illness or other serious problems, according to a report from the director of the Holy See Press Office, Fr. Federico Lombardi, S.J., following the morning meeting. Cardinal Oscar Andres Rodriguez Maradiaga explained that the meeting of the Council of Cardinals (the so-called “C9”) which came to an end yesterday afternoon, focused primarily but not exclusively on the reform of the Curia. Other themes addressed were the regulation of the Synod, the work of the Commission for the Protection of Minors, and relations with the economic entities of the Holy See (COSEA and IOR). Bishop Marcello Semeraro, secretary of the C9, presented the main lines of reform of the Roman Curia, in the light of the meeting of heads of the dicasteries that took place in November 2014. The issues to be considered are the functions of the Roman Curia, its relationship with other entities such as the episcopal conferences, the criteria for rationalization and simplification that must guide it in its tasks, the Secretariat of State, the coordination of the dicasteries of the Curia, the relationship between religious and laypersons and the procedures that must govern the preparation of the new constitution. Reference was also made to the institution of two congregations. The first would encompass those organisms that until now have been concerned with the laity, the family and life. The second would deal with matters linked to charity, justice and peace. The collaboration of the pontifical councils and academies dedicated to these themes could be strengthened. Twelve prelates intervened during the morning session, observed Fr. Lombardi: mainly cardinals who have a profound knowledge of the workings of the Curia, although there have been contributions from a diverse range of contexts. It has been observed that reform is twofold, theological and juridical, and many of its assumptions relate to canon law and ecclesiastical jurisdiction, as well as relationships with the episcopates. It was also noted that the Pope is assisted not only by the Curia, but also by the College of Cardinals and the Synod of Bishops. In this regard, the themes of synodality and collegiality were discussed, and preference was expressed for the latter denomination rather than the former. The issue of the ongoing training of staff of the Roman Curia was not overlooked, and consideration was given to the possibility of a rotation of duties to counteract routine. In this sector, both favourable and contrary opinions were expressed by the cardinals, who emphasised that some fields require a high level of specialisation and that for this reason, change would be inadvisable. On Saturday, February 14, at 11 am in St. Peter’s Basilica, Pope Francis will preside at an Ordinary Public Consistory for the creation of new cardinals and to vote on several causes of canonization: Blessed Jeanne-Emilie De Villeneuve, foundress of the Congregation of the Sisters of the Immaculate Conception of Castres, Blessed Mary of Jesus Crucified (nee Maryam Baouardy), professed nun of the Order of Discalced Carmelites and Blessd Marie-Alphonsine Danil Ghattas (nee Maryam Sultanah), co-foundress of the Congregation of the Sisters of the Holy Rosary of Jerusalem of the Latins.